We are finally around to the first week of finals, in what is talked about as a fairly open finals race. Read on to find out what we are predicting this week and for the rest of the finals series! Firstly to our final ratings for the regular season interestingly, our top 8 rated teams all made finals! Sydney surged ahead after Adelaide’s dead rubber loss to WCE. Those two teams were clear of a pretty well ordered top 8 - the only teams whose finishing position on the ladder didn’t match their rating position is Richmond and Sydney. The step between each team is pretty even suggesting that we probably ended in a pretty natural order based on our ratings which is interesting. Last year we had two distinct groups. 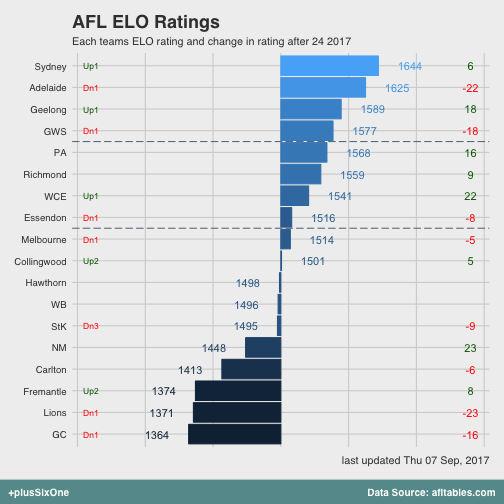 That natural ordering means we don’t really have any super close matchups, at least according to our ELO ratings system. That being said, three of the four games have predicted margins less than 2.5 goals so they aren’t certainties by any stretch. Perhaps the Sydney v Bombers game is the only confident tip we can provide. Simulating the finals through to completion we can see that our two top rated teams are our biggest chances for lifting the cup. 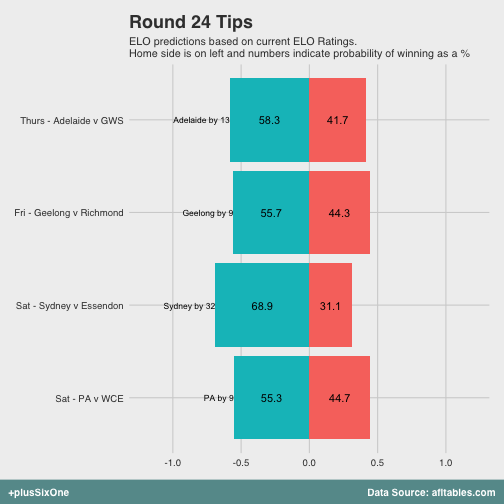 Adelaide interestingly make half of all grand finals in our simulations. 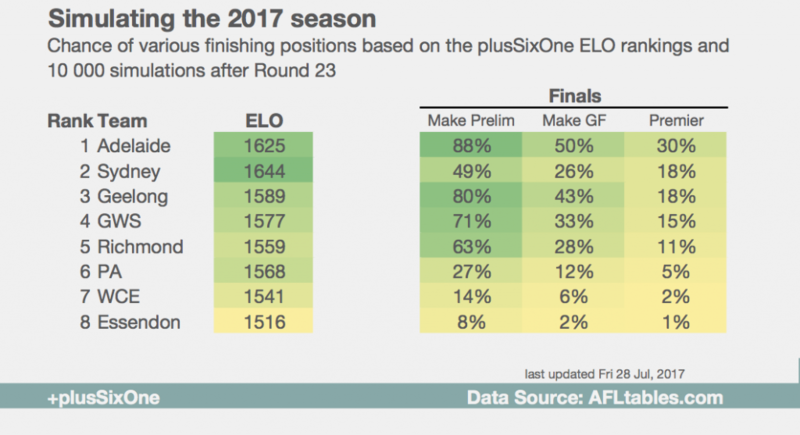 Geelong isn’t that far behind but typically fall down - of the 43% of grand finals they make in our simulations, they win 18% of them. Sydney win the same number of premierships but only make 26% of grand finals! This is likely because they have surged through 3 knock out finals, with 2 of them being away, extending their lead in the ratings! Unfortunately for Essendon, Port Adelaide and West Coast, you seem to be making up the numbers. Nonetheless, the Bulldogs were a 1% shot at the start of the finals last year and we all know how that ended!